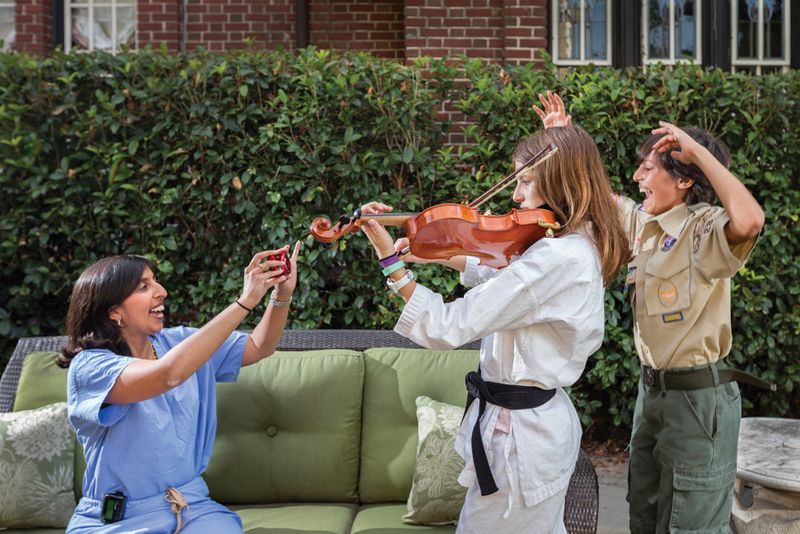 Meet five women with very different passions who are making a difference in the lives of those around them. The title for this feature started as Super Moms. 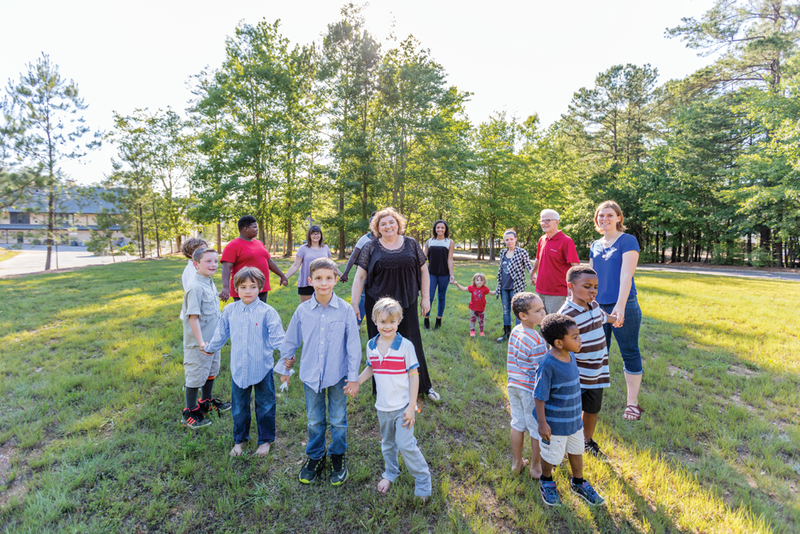 And while that moniker certainly fits the women we interviewed, they are a representation of the legions of Birmingham women—not just moms—who are working to create better lives for the people around them. Those featured here lead very busy lives that are full of family, careers, volunteer commitments, and personal passions. They struggle daily with achieving a work-life balance while raising decent human beings. These women have one thing in common—a contagious zeal for life. And it seems they are good at hiding their super mom capes. The clean lines and soft colors so often found in classic Belgian design might seem a world away from the dizzying florals and flouncy chintz sometimes seen in Southern textiles—but don’t tell 32-year-old Julie Maeseele that. As the 2016 Birmingham Fashion Week winner in the Emerging Designer category, Julie offers a fresh take on what it means to be a European clothing designer in the South. Two years ago, Julie and her husband, Antenor Lodewyck, relocated from Belgium to the Magic City for his job with BBVA Compass Bank. Friends and family back home must have thought the pair was crazy for putting down roots here, but something resonated deeply with them. Julie credits her new home with much of her sense of calm, and that same peacefulness plays out in the clothes she designs. This mother of two is focused while maintaining a quiet serenity that belies her drive. How did you get into fashion? My whole family is artistic, so it was very natural for me. I always dreamed of being a fashion designer, but when I had to pick my university (in Europe), I was intimidated by the scene, which seemed kind of pretentious at the time. So I studied art and textile design, making everything but clothing: shoes, rugs, installations. After giving birth to my daughter, I realized that fashion was really what I wanted to do, so I trained as a seamstress. I figured out the rest on my own. But I would say that I started for real about a year-and-a-half ago. After we moved here, I had the peace to start my business. There are so many clothes out there, and at first I thought, “Why would I need to make another cute dress?” But I wanted my work to have more substance—an emotional significance. Every single thing we wear went through someone’s hands—or multiple people’s hands. But as clothes are made faster and cheaper, it comes at a cost for these workers. There is a documentary, The True Cost, that I wish everyone could watch to see how clothes are really mass-produced. I want to help create that awareness for people. It sounds like this is both a career and a passion. It definitely is a passion. I try to add history to my clothing by including the name of the person who made each item on the label. I also pick my materials carefully using overstock, and I try to recycle. I am figuring out new ways to use fabric. I feel like this is the future of fashion. Did you have a mentor or someone who inspires you? Designers like Stella McCartney and Raf Simons have this “Slow Fashion” ideal that inspires me. Another mentor is Manuel, also known as the “Rhinestone Rembrandt.” In his shop on Broadway in downtown Nashville, he has made custom clothes for people like the late Johnny Cash and Lady Gaga. After I won at Birmingham Fashion Week, I knew I needed to learn more skills. So I just found him online, emailed him, and asked for an internship. He agreed, so last fall, I went back and forth to Nashville to learn from him. He was very flexible and let me set my own schedule. In addition to learning some of his techniques, what else did you take away from your time with Manuel? His spirit! He says that in Mexico, they like to say, “Sí, se puede, ” which means “Yes, we can.” You need to be excited for yourself. You cannot wait to be discovered. Go after it. Manuel is 83 and still working! How do you do it all, especially with two young children? Since we do not have family here, a Mother’s Day Out program is a huge necessity for me. And I could not do any of this without the help of my husband. When I was working with Manuel in Nashville, Antenor was able to change his work schedule so that I could take advantage of that opportunity. What has been your biggest obstacle to accomplishing some of your goals? My own ego, fears, and insecurity. I didn’t find my direction until I had my first child. When you want to feel pretty, what do you do? I definitely get a full night’s sleep! Sleep is everything! It is good for your confidence, and it does make me feel prettier. Heat butter in a large stockpot over medium-high heat. Add onions, and sauté 5 minutes or until onions are translucent. Heat a large skillet over medium-high heat. Add 2 tablespoons olive oil. Working in batches, brown beef on all sides. Use a slotted spoon to remove the beef from skillet. Add beef to stockpot with onion. Add brown sugar, and stir to combine. Add pale ale to stockpot. Use a wooden spoon to scrape up any browned bits from the bottom of the pot. Add beef stock, thyme, and bay leaves, and bring to a boil. Spread Dijon mustard on one side of bread and place, mustard side down, over beef mixture. Reduce heat to a simmer, and cook, uncovered, for 2 hours. Season to taste with salt and pepper and stir until bread is absorbed into stew. Before serving, remove and discard bay leaves. Garnish with chopped fresh thyme, if desired. Serves 4. Note: If you like your stew thicker, you can thicken it by adding cornstarch at the end and simmering for a few more minutes. Born in California, and raised in an ever-moving military family, Laura teaches life-saving swim skills to children. When she’s not in her pool, you might find her beside it, working her other job as a fitness instructor. 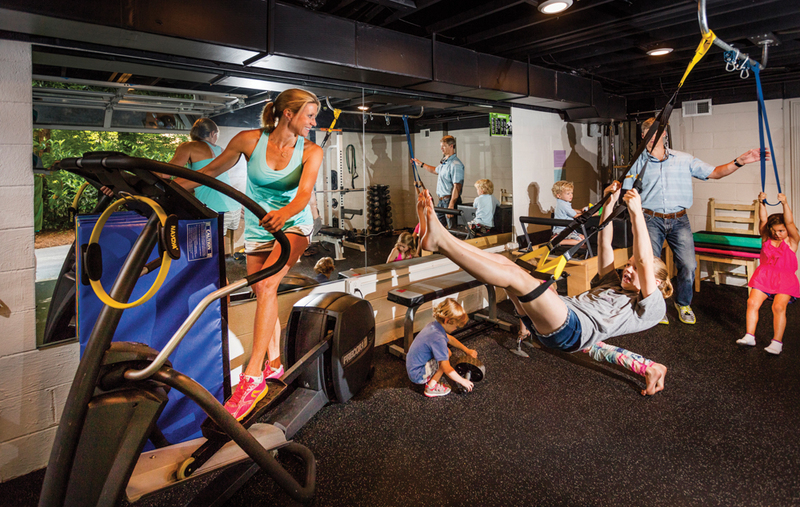 She may be helping fellow moms master their chaturanga yoga pose, or she may be encouraging those same moms as they sprint down her long driveway or do squats in her custom home gym. Especially inspiring is how Laura seamlessly blends her personal passions with her professional side, her family life with her healthy ethos. Watching you teach one of your classes today, the vibe feels so positive and upbeat. How do you keep the energy going? This is a very positive group of women. I am pretty laid-back by nature, so it did take me a little time to realize that some people might need more help than I initially thought. For example, I sometimes have to physically show them what an exercise looks like before we do it as a class. That has helped me grow a lot as an instructor. What do you enjoy about the teaching aspect of class? Everyone in the class is not at the same fitness level, and I enjoy encouraging each person to reach personal goals. I have about 8 to 10 regular participants who come to my house twice a week for 14 weeks, and I often break the class into two groups to mix things up. Everyone gets something out of class, even if it is just the act of being together. I love that we talk a lot throughout our sessions. Tell us about some of your other passions. I enjoy helping out at my kids’ school, and I also volunteer at Emmet O’Neal Library. My husband and I taught a confirmation class this past year at Canterbury Church. I also just ran my third Boston Marathon in April, which was my sixth marathon overall. I think I will take a break from marathons for a while; I need the break from the training! I do still love to run and always take my dog, Baxter, with me. He’s my training partner. Were you always a runner? Did you grow up running? I grew up swimming, training twice a day. I joined my first swim team at age 4. Everyone in California swims. I sacrificed a lot, and the schedule was grueling, so there was no time to run. I became a runner when I started having children. It was something I could do while pushing a stroller. We could run to the park and play and then run home. Occasionally, I will stop by the Crestline Piggly Wiggly in the afternoon and pick up various readymade soups, some cornbread, and a few toppings off the salad bar (bacon, eggs, feta cheese). When I get home, I can make a big salad, and then everyone gets the soup they want. So easy. Tell us a little about meals at your house. For dinner, we always have a protein and veggies. We don’t eat bread at night, that’s kind of our thing. My husband, William, sometimes grills salmon while I make a mashed sweet potato side. I love to make squash casserole. And we have a steam oven, so I’ll steam a lot of vegetables. The kids eat what we eat. And once the kitchen is closed at night, it is closed. What is life is like going from having three kids to five. We had three girls already (Ava, 12; Abby, 9; Annabel, 5) and then decided to go for a boy and ended up having twin boys (Liam and Win, 3)! I am so glad they have each other. It is challenging, but it is super fun. These boys are going to keep us young. William and I talk about that all the time—there is no question that they will make us feel 40 when we hit 50. Although, I will say that one time I did the math and figured out that I will be 60 when the boys graduate from high school and could very well be a grandmother at that same time. Ava will be almost 28 when they are 18, so it could happen! Stop and smell the roses. No matter what season of life you are in, enjoy it. Sometimes we just wish away too much. Stay present. Embrace where you are. Where do you go when you want to get away from everything? On a run with Baxter. What is one thing you can do better than anyone else you know? Laundry. We have two washers and dryers, and I can knock out seven people’s laundry in no time! And I am super fast at folding. 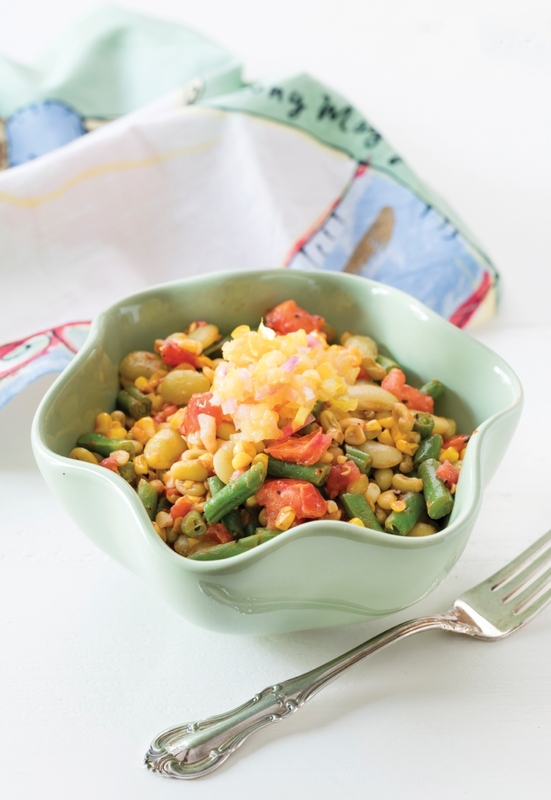 This tangy salad from Cooking Light is a great way to use fresh vegetables from the farmers market for an easy summer meal. Combine onion and pickled banana pepper juice in a bowl; let stand 15 minutes. Stir in minced banana peppers and ¼ cup oil. Set aside. Combine tomato and ⅛ teaspoon salt in a bowl; let stand 10 minutes. Heat a large skillet over medium heat. Add remaining 3 tablespoons oil to pan; swirl to coat. Add garlic; sauté 2 minutes or until golden. Increase heat to high. Add remaining ⅛ teaspoon salt and corn; cook 3 minutes or until corn begins to char. Stir in tomato mixture; cook 1 minute. Add green beans, butter beans, and peas. Bring to a simmer; cook 3 minutes. Remove pan from heat; stir in butter and black pepper. Place about ¾ cup bean mixture on each of 8 plates or small serving bowls. Top each serving with about 1 tablespoon banana pepper mixture. Serves 8. Balance might be the one ideal we all strive for, but ask 10 different women what their idea of balance is, and you will get 10 very different answers. For urologist Rupa Kitchens, it means equal parts family, work, and social and community engagement. It seems that finding more than 24 hours in a day to do it all might be the one thing she hasn’t mastered yet. Let’s talk about goals and success. What do those things look like to you? I want what everybody else wants—to raise our children to be decent people who are independent and well-balanced. I also think you need to have fun. That’s why our family travels a lot—the only time we can really relax is when we get out of the city. We love our community and love being involved, but sometimes we have to get away. What has been the biggest obstacle to achieving your goals? Time. If I could survive on four hours of sleep, maybe I could get it all done. Aside from being a practicing urologist, tell us what drives you. So many things! My husband, Dave, and I are part of two groups at the Birmingham Museum of Art—the Indian Cultural Society and the Emerging Collectors Society. I am also on the board of GirlSpring, which is all about empowering young girls. These girls need to understand that they have the potential to go beyond what they might have been told they could do. GirlSpring gives them the resources to better talk with their peers and to develop relationships with mentors. They also have a web site, GirlSpring.com, where girls can read articles on topics like school, bullying, eating disorders, dating, and college. I was really a perfectionist back then; everything had to be just right. But I am not like that anymore. Once you have kids, you realize you don’t have time to be like that! I did not relax as a 15-year-old, but now I see the rewards that relaxation brings. You have to reset your brain and recharge. I also should have spent more time with my parents. Back then I was in such a hurry to get out of the house! How do you make quality time with your family? We travel together. This summer, we are going to Peru and the Galapagos Islands. We’ve been to India on the last three Birmingham Museum of Art trips. We’ve also been to Africa three times and to South America. My daughter Maya and I have enjoyed being in an Indian classical folk fusion group for about 10 years now. We practice every week and have performances all the time, both in town and out of town. There are about 40 members, and we range in age from little kids to mid-50s. And it’s not just Indians! We have people from China, El Salvador, Italy, and America—it’s a really nice multi-cultural group. We do not cook at all except on Sundays. Otherwise, it just doesn’t happen. We get home too late, and the kids need to eat before they head off to their evening activities. 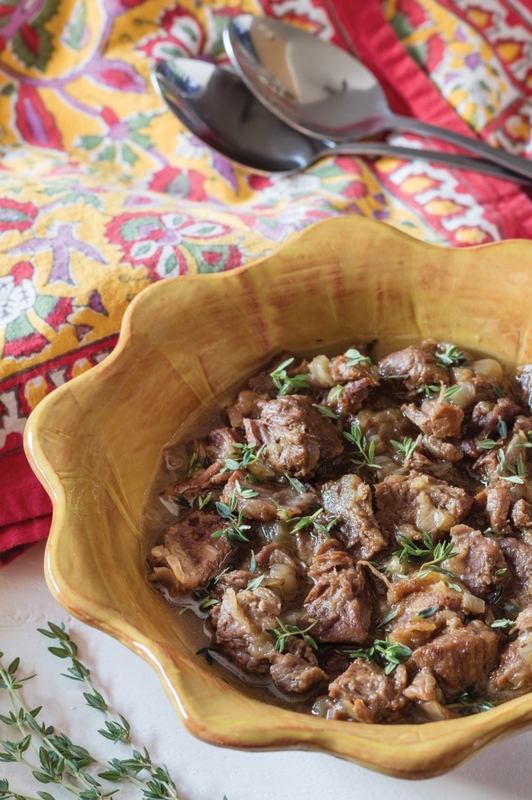 As long as no one minds eating leftovers, we cook everything on Sundays and then we’re done. And this might not fall under the ‘life hack’ category, but I have realized that I need to find time to be social. Many years ago, a group of us Highlands School moms went to hear Amy Chua (author of Battle Hymn of The Tiger Mother) speak at The Club. Afterward, we went to AVO for a drink, and it kind of turned into what we now call the After Eight Club. Once a month, we meet around 8:30 p.m. for wine and cheese at someone’s house and just catch up on things. So do you consider yourself a Tiger Mom like Amy Chua? No, she was too extreme for me. I think her kids turned out fine, but at what cost? Unless you are going to grow up and be a concert pianist, I don’t think anything is that important that it should take up all of your free time. You only have one chance to be a kid. Maya and Deven each do a lot of things outside of school, and my husband and I practically beg them to give up one or two things. But we do tell them that if they want to take piano or karate, they have to put in 100% effort and practice! If you are going to do something, do it to the best of your ability. Until one of them can drive, it is a lot of work for us too. Monday through Friday, there is something every night. It can be exhausting. And Saturday and Sunday go by way too fast. So, no Tiger Mom for me. But thank you, Amy Chua, for inspiring us to create the After Eight Club! What do you do when you want to get away from everything? If I can just get out of the house and feel the sun on my face I’m good. Now, if I want to actually leave the house, I will find a spa somewhere. Ross Bridge is a great escape. Aside from being a doctor, wife, mother, art collector, and volunteer, tell us one thing you might do better than anyone else you know. Maybe one thing that I am “the best” at—and you will think I’m so old school—is that I always remember birthdays for immediate and extended family, as well as for my closest friends, with Hallmark cards that get mailed. Younger friends get Halloween and Valentine’s Day cards too. I probably mail anywhere from 60 to 80 cards a year. Birthdays should be recognized, and I feel a card is better than a text, email, or e-card! Is there one thing people will be surprised to learn you do not know how to do? I cannot just whip out an Indian food dish! My mom can, but I definitely did not get that from her. Spelt is a high-protein ancient grain that’s enjoying a resurgence. This flavorful pasta is perfect for an easy meatless supper. 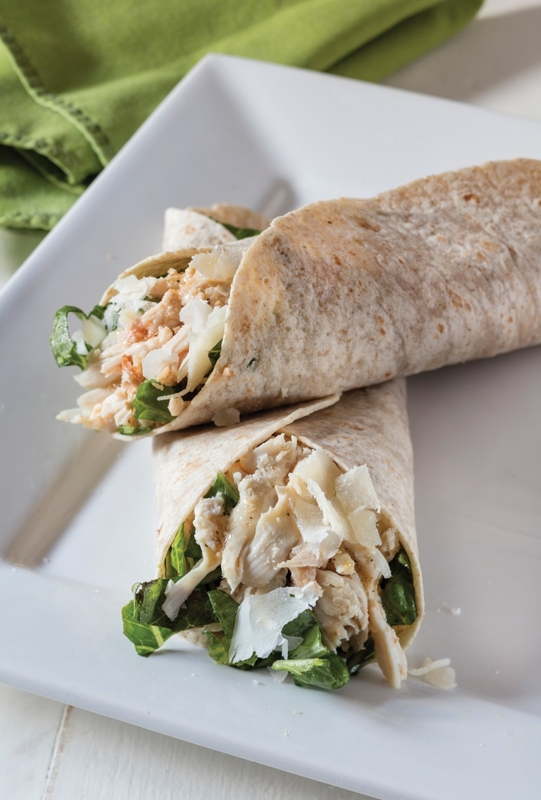 In a food processor, combine arugula, basil, garlic, pine nuts, and salt and pepper to taste. Process to coarsely chop. With the food processor running, slowly add the oil in a steady stream and process until the mixture is smooth. Prepare pasta according to package directions. Drain and place in a large serving bowl. 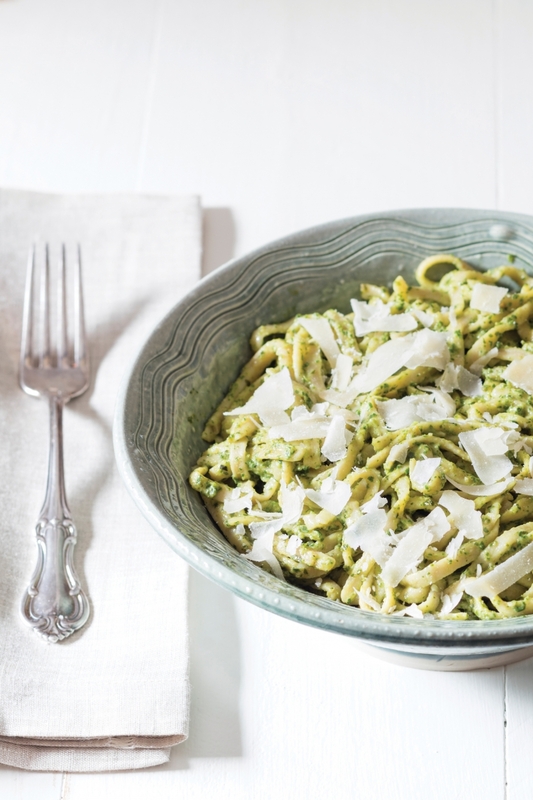 Add pesto to pasta, and toss well. Sprinkle with cheese. Serves 4. 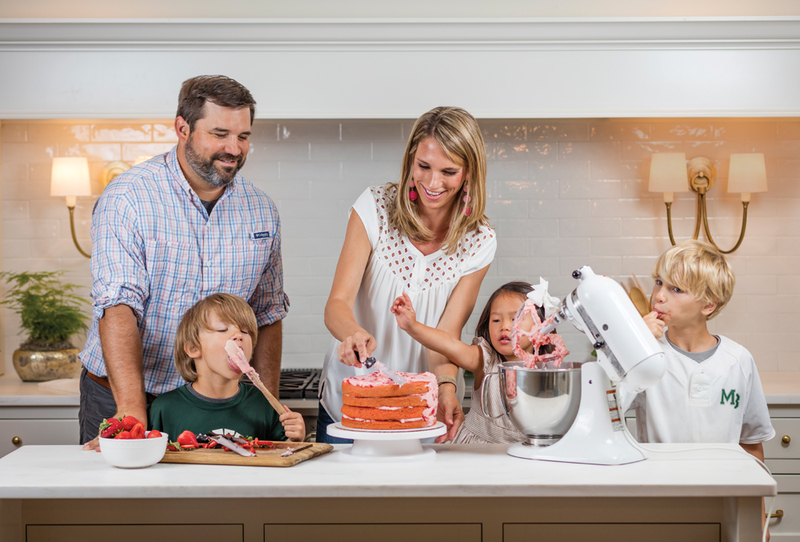 It would be easy to say that life has always been sweet for Ashley McMakin, but underneath that dreamy strawberry icing, you will discover something much richer. A post-collegiate experience in China had sparked a desire to adopt, but she had no idea when and how that would ever happen. It took establishing a catering business to make that dream a reality. Like many women, Ashley struggled with fertility issues. While she and her husband, Andy, worked to transform her side-hustle baking-and-catering gig into the Ashley Mac’s we know today, they were also working to pursue their dream of a full house. Successful IVF and artificial insemination treatments gave them sons Ryder and Jackson, but Ashley still held on to her dream of one day adopting a child from China. It took a lot of paperwork—and even more patience—to finally get their Mally, but it is safe to say that it has all been worth it. Because of the more than 150 million orphans in the world, Ashley is now a huge advocate for adoption and improving the lives of everyone around her. How did Ashley Mac’s get started? It sort of goes along with that saying, “Life is what happens while you are making other plans.” I was working at an advertising agency, and I started doing baking and catering as a hobby. I thought it was just something fun to do on the side until we had kids. But my husband, Andy, said, “You should make this a business!” He is very entrepreneurial-minded. After three months of doing both jobs, I had to decide which career I wanted to pursue. I was delivering corporate meals on my lunch hour, and it was getting hectic! So in 2005, I quit my advertising job to pursue the catering business. But even then, I thought it was something I would do just until we had kids. It took longer to get pregnant than we thought. We worked to grow the business but longed to have a family. We started doing infertility treatments and had Ryder and then Jackson a few years later. We wanted another child, but we didn’t know if I could pregnant again. That was when we embarked on our journey to adopt Mally, which we did in 2015. Mally was 2 years old when you adopted her. Once you decided to go for it, what was that process like for you? You fill out so much paperwork. That was almost a full-time job in itself. Thankfully, my business allows me the flexibility to do all that. We knew we wanted a child aged 0 to 3 because getting a newborn from China just never happens. It just takes that long. Mally had been abandoned at five months and was in an orphanage. Once we finally were matched, it was almost a year before we were able to bring her home. Even though the one-child policy is not really enforced anymore, many Chinese parents still only want boys. Something else that helped us was that we were also open to the option of adopting a child with some issues. Mally was born with a heart defect that required surgery. Will you try to adopt again? I would have loved to adopt more children, but I think we are done. Andy and I have this running joke that with every store we put in, we had another child (Ryder, Bluff Park; Jackson, Cahaba Heights; Mally, Riverchase). Now we are set to open our downtown location in the financial district at 5th Avenue North, and I told him we might need another child. But, no, we’re breaking the streak. What’s a routine you treasure with your kids? I love reading Thoughts to Make Your Heart Sing by Sally Lloyd-Jones each morning with the kids. They are short—just one or two paragraphs—but also so deep. I get as much out of it as they do, and it sets the tone for the day. One of our core values at Ashley Mac’s is grace. I want to grow the business while still staying true to that. We want to give people meaningful employment and see each employee as a whole person, not just what they can do for Ashley Mac’s. Another goal has been to get the business running well—with me or without me. We have gotten to that point, so now I can spend more time with the kids, and I can spend more time volunteering with groups I am passionate about. I volunteer with Lifeline Children’s Services, which is an adoption agency. I also work with Five Loaves, an organization that teaches culinary skills to high school students interested in that line of work. The students work together to produce all aspects of regular pop-up dinners. They use our kitchens to prepare the food they serve. Andy and I are both involved with Changed Lives Homeless Shelter. Our kids will go with us when we serve dinner there once a month. We also employ a fair number of the Changed Lives residents at Ashley Mac’s. Where do you find the inspiration for baking? I love the Bake from Scratch magazine from Hoffman Media. I am obsessed with it. The photos are gorgeous, and it so well done. It is high-end enough to make you feel like you are making something very special that you can’t find just anywhere. I can’t garden! I feel like all of my chef friends have beautiful gardens, and I am just trying to keep my three herbs alive. Combine olive oil and next 6 ingredients in a small bowl. Stir well with a whisk, and set aside. Cook orzo according to package directions until firm and tender. (Be sure not to overcook pasta or it will be mushy and the orzo will stick together.) Drain, rinse, and let pasta stand until cool. 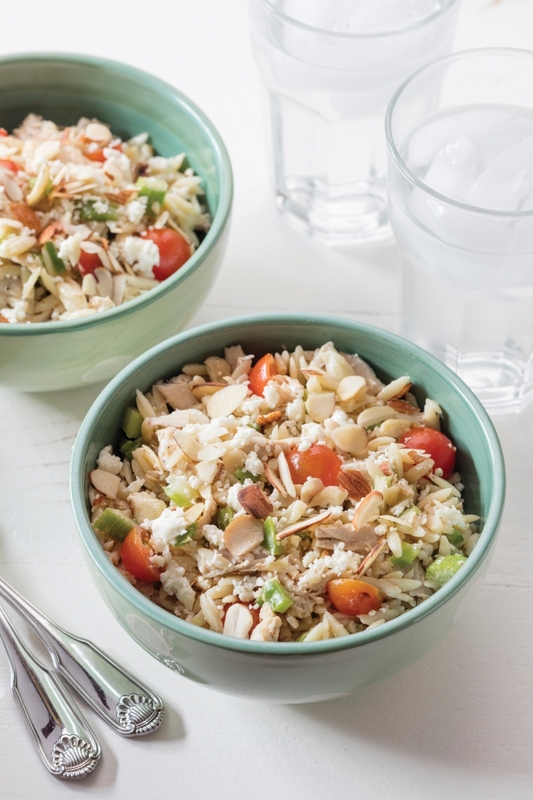 Combine orzo, chicken, 1 cup almonds, celery, tomatoes, green pepper, and 1 cup feta. Add vinaigrette, and toss to mix well. Add salt and pepper to taste. Cover and chill in the refrigerator. Serve cold. Garnish with remaining 1 cup feta and remaining 1 cup almonds before serving. Serves 8 – 10. We have all been behind one of those cars with the decals that represent each family member and their passions: the son who loves soccer, the daughter walking her dog, the dad who mans the grill. One can only wonder what the back of Anna Giattina Lee’s vehicle would look like if there were one of these figures for each of her children. The Birmingham-born-and-bred mom to 20-plus children has left a positively indelible mark on more than one generation of kids who desperately needed her. The three biological and more than 17 adopted members of her brood have grown up knowing love, patience, grace, and selflessness. An additional three dozen have been fostered in her Mt. Laurel home. She will be the first to tell you that she is far from perfect, but her approach to child-rearing is pretty simple and can certainly be replicared on a smaller scale. But don’t go offering her a halo or any special treatment. Anna would be the first to wave off any adulation for her accomplishments. What she wants people to know about her is that she is not unique. She says almost anyone could do what she and her husband, Alan, have done—take in, raise, and care for children who had nowhere else to go. You grew up in a household with foster children. Is that where you were first inspired to want to want to foster and adopt? The story actually started with my sister Grace and me. I was in 5th grade and she was in 4th grade when a nun from Catholic Social Services came to our school (Our Lady of Sorrows) to talk about foster care. This was around 1972 when they did not really have foster homes. There were only group facilities or children’s homes at that time. When I heard her speak, I knew that something big was going to happen, but I didn’t understand it. They were looking for new foster families, and I couldn’t quit thinking about the fact that there were kids out there who didn’t have their parents and needed someone to take care of them! I can remember standing outside of school and thinking, “My life is going to be really different, ” but I had no idea what that meant. I went home with the flyer they gave us to help recruit foster parents, and my mom says that my sister and I convinced them to start fostering. The talk was for the kids and not the adults? Yes, it was actually kind of brilliant on their behalf because now they’ve gotten 50 years out of me as a foster family! My parents started taking in newborns to foster just until the babies were adopted. That experience kind of informed how I thought about foster care. I might have known I wanted to do this, but it was my parents who showed me how to do it. I learned from them how to accept anybody in any situation and to invest in them. I knew it was something I would continue doing for a long time. Fast forward to when you met your husband, Alan. Did you talk with him about fostering and adoption prior to getting married? At first, my husband said no way. We got pregnant on our honeymoon and proceeded to then have two more girls right after, so we had three kids under the age of 4—and I was still practicing law at this point! On our fifth wedding anniversary, we went away to Cheaha State Park for our first weekend alone since having kids. On that trip, we met a group of girls from the Presbyterian Home for Children. My husband, who is quiet and does not talk to a soul, started a conversation with the adults in the group, and they shared with him all about the foster program. He said, “Is this the kind of thing you were talking about? I could do this!” Six weeks later we got our first child, Gail, and she’s now 36. We were told she’d never live independently because she had so many issues, but now she lives in New York with her husband and daughter. She owns a house and a car and has a job. How would you briefly sum up your approach to raising children? If I think about parenting in terms of the immediate results I get to see, I am disappointed all the time. I have to think about it in terms of whether I am doing what I am supposed to be doing as best I can when I am supposed to be doing it. And then I have to leave the rest to God. I don’t get to have control. Do you and Alan parent all of the kids the same? No. We parent according to the needs of the child. Some of the kids are home-schooled, some are in public school, and some are in private school—it’s all based on their needs. But we have the same goals for every child: We are aiming for all of our kids to grow up and be independent. We want them to understand their relationship with God and be capable of contributing to society instead of taking from it. Those are the basic things, but how each child gets there is different. Are you able to keep a tidy house with so many people under one roof? The kids can be as messy as they want to be in their rooms. I learned early on that you can’t make your whole life about keeping the house clean and perfect when you have 20 kids in the house, so I don’t even go there. Common spaces are tidy, but that’s it. What does bedtime look like at your house? We do the bedtime stuff downstairs—all the hugging and kissing—and then the kids go on upstairs to put themselves to bed. It just works! How do you shop for groceries for so many people? Well, it is a whole lot of thrifty shopping in bulk. We have two freezers and three refrigerators. Everything we buy is based on storage. I can feed about 10 of us for $10 if I am shopping the way I am supposed to. I stockpile things when they go on sale. My rule is not to spend more than $2 per pound for anything.